An experienced veteran of the Cornhusker State Games, Nita Lechner loves a good competition. A former school teacher from Grand Island, Lechner has been participating (and winning) a wide variety of sports since the second-ever Cornhusker State Games in 1986. A former college swimmer at the University of Nebraska at Kearney, swimming was naturally the first competition Lechner entered in the Cornhusker State Games. “I was a swimmer, so it was always exciting to win golds in the Cornhusker State Games and that wasn’t difficult for me, but I love medals,” she said. Lechner quickly found other sports she could try her hand at, including the likes of softball, volleyball, and discus. Her family also participated in the fitness walk together for years, but a health diagnosis Lechner received over six years ago threatened her ability to not only participate in sports, but to even walk again. Doctors found a tumor on Lechner’s spinal cord right at the base of her neck and indicated to her that she had an 80% chance of total paralysis and 10% chance of partial paralysis. Lechner managed to fully recover from the surgery with no ill effects, although with two knee replacements and a rod up her right leg, she is grateful that her body still allows her to compete. “It’s been a journey and I want to compete as long as I can, and some of my best friends are people I’ve competed with and against,” she said. 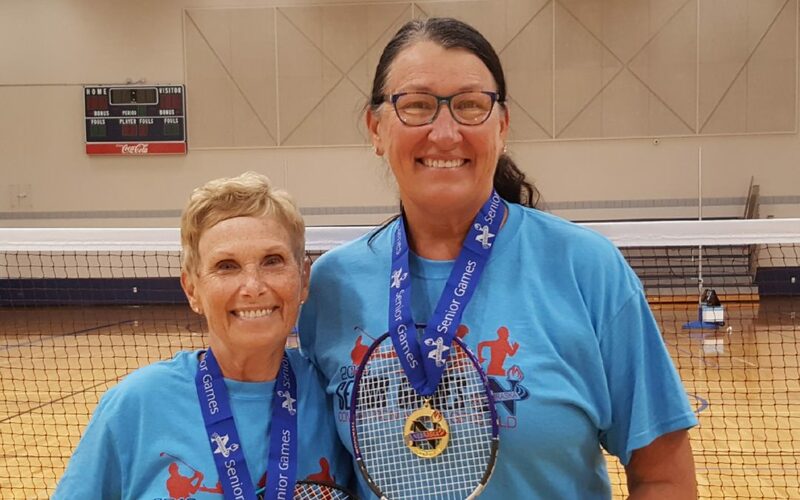 The 2018 Nebraska Senior Women’s Athlete of the Year, Lechner will compete in pickleball and badminton this year with her doubles partner Carolyn Foster, who won the same award in 2007. The duo have been competing together for the past four years and will be traveling to Albuquerque, New Mexico in June to compete in badminton nationals. The pair met while both working as school teachers, a job which Lechner said she enjoyed every single day without fail. Along with her teaching career, Lechner also owned a healing center and spa for 26 years, and has the gift of physical touch. Six years ago, she began Hugs 101, and began her campaign of giving hugs around the country. After going to many states, she decided to hit all 50 in the past three years, ending in a trip to Anchorage, Alaska in December.